Why has the populist radical right outperformed the populist radical left in Europe? Populist parties on both the radical right and left of the political spectrum in Europe have made considerable electoral gains over the last decade, but they have done so using notably different approaches. Valerio Alfonso Bruno and James F. Downes draw on recent election data to show the extent to which the radical right has tended to outperform the radical left since the late-2000s financial crisis. They argue that the radical right has been able to offer a clearer message on key issues such as immigration which has translated into greater electoral success. Twenty-first century European politics has been characterised by patterns of electoral volatility, alongside the recent economic and ongoing refugee crisis. This has allowed ‘populist’ parties on both the right and left to capitalise on the electoral failure of mainstream centre left and right parties. There has been a considerable amount of research on the recent rise of populist radical right and populist radical left parties. A number of studies have shown that these parties have shaken up the political landscape in contemporary European politics during times of economic and political crisis. But surprisingly few studies have examined the electoral fortunes of radical right and left parties together. The figure below demonstrates that in the last two national parliamentary elections that fall across the recent refugee crisis period, the radical right made the largest electoral gains in EU countries. Mainstream centre left parties suffered the largest losses, underlining the electoral downfall of this party family in the post-economic crisis period and wider anti-incumbency effects. 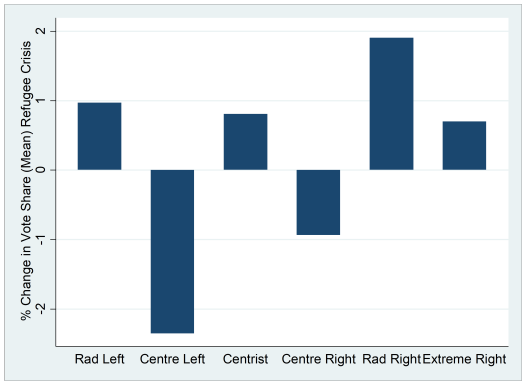 Radical left parties performed well electorally, but their electoral gains were considerably lower than those of radical right parties. The radical right has made considerable use of the refugee crisis to build its support. Two of the most striking examples are the 2017 Austrian legislative election which ultimately saw the Freedom Party of Austria (FPÖ) entering into coalition with the centre right Austrian People’s Party (ÖVP), and the 2018 Italian legislative election, which saw the radical right League enter into a coalition with the Five Star Movement. Those radical left parties which have made gains in recent national parliamentary elections include the Left Bloc (BE) in Portugal, which substantially increased its vote share in the 2015 Portuguese legislative election. Other parties, such as Syriza in Greece, and Podemos in Spain, have achieved notable electoral success over the last decade. It is important to note however that this success is not uniform, with some parties faring less well electorally and others facing challenges maintaining their support. What factors can explain the electoral success of radical right parties in the post-economic crisis period? First, the party strategy of the radical right has tended to be simple and clear, with a focus on issues such as immigration and an attempt to link this directly to general discontent and dissatisfaction with the EU. Second, the radical right has a much broader voter base to target with this narrative than radical left parties have. Recent research has shown that radical right parties have the ability to attract traditional working-class voters away from centre left parties, primarily due to their effective use of the immigration issue. The simplicity and clarity of the radical right message has been a key part of their success. Powerful images of nationhood have combined with fears over issues such as immigration to drive this support. Capitalising on popular fears has been shown by previous research to be a core element of the radical right narrative. And the ‘accessibility’ of this message is arguably one of the most important differences between the approach of the radical right and the radical left. In contrast, the radical left remains to some extent a platform for abstract intellectual ideas. Such narratives are far more difficult to translate into the slogans and messages which have proven successful in the digital age of politics. The perceived inability of the radical left to form concrete policy responses to the global economic crisis has not helped their cause. The radical left has in many cases failed to weave together a clear and simple narrative on the economy which can rival the message of the radical right, while it has also been less willing to focus on the key issue of immigration which the radical right has used so effectively to attract support. Radical right parties have ultimately been better placed to offer a clear ‘populist’ message on issues such as immigration and the EU, thereby capitalising on the disaffection of voters. But understanding the reasons why the radical right, as opposed to the radical left, has proven particularly adept at winning support will be of obvious importance for European politics in the coming years as the electoral power of populism is unlikely to disappear in the short-term. Valerio Alfonso Bruno holds a Ph.D. in “Institutions and Policies” from the Università Cattolica del Sacro Cuore of Milan (2017) and was doctoral researcher at the University of Fribourg, Switzerland (2015). James F. Downes is a Lecturer in Comparative Politics in the Department of Government and Public Administration at the Chinese University of Hong Kong. He is an Affiliated Visiting Research Fellow (Honorary) at the Europe Asia Policy Centre for Comparative Research. He is also a Data Advisor for the Local Democracy Dashboard project, based at the London School of Economics. Poland – the government would in normal circumstances be called middle of the road Christian Social Democrats. They are setting up the welfare state, have slashed child poverty, made Big Business pay tax, secured trade union support, made state-owned companies profitable (previously moribund and primed for privatisation to “mates”), smashed enormous mafia activity and have brought pluralist views to the previously monolithic TV news offering (3 flavours of post-Communism). And they have removed the previously common police brutality from the streets, which also featured agents provocateurs. And they’ve slashed the current account deficit. But these are not normal circumstances. Poland had 5 presidents in the period 1989-2015. One wasn’t a Communist – and he was assassinated. The transition deal between the Communists and the West in 1989 was to sell 2/3 of the economy to Western oligopolists and to leave the levers of power in Poland to the Communists. It was a denial of the democratic ideal – for cash! Did you read this interesting article appeared on Project Syndicate few weeks ago by Mitchell A. Orenstein? “Consider Poland, where the ruling Law and Justice (PiS) party won 38% of the vote in the October 2015 parliamentary election. In April 2018, despite mounting authoritarianism and official complaints from the European Union, opinion polls put support for the far-right PiS at 40%. The PiS does not owe its rising popularity to its anti-immigrant stance alone. In fact, the Catholic nationalist right has won around 30% of the vote in Polish elections since 1989 with consistently anti-Semitic, anti-EU, anti-immigrant, and anti-Russian appeals. What is new about this PiS government is its more moderate face. PiS is led, at least superficially, by younger politicians, including President Andrzej Duda and Prime Minister Mateusz Morawiecki, who succeeded Beata Szydło (also a relatively new face in Polish politics). Each was focus-grouped for broader public appeal. The strategy worked. In 2015, PiS won its usual base, plus an additional 5-10% of more moderate voters. And, having lured these moderates, PiS has kept them, by offering what previous governments have rejected. Although the Civic Platform, which governed until 2015, grew out of the Solidarity movement of the 1980s, it betrayed its working-class base by pursuing radical neoliberal economic policies that increased economic inequality. The former communist party, having embraced social democracy in the 1990s, betrayed its roots in the same way. By contrast, PiS has established the most significant addition to the Polish social safety net since 1989: the Family 500+ program. Launched in 2016, Family 500+ embodies the nationalism, traditional family values, and social consciousness that the PiS seeks to promote. The program pays families 500 złoty ($144) per month to provide care for a second or subsequent child. Families apply each September, when children go back to school. Except for poor families, a family with only one child receives nothing, while families with two children qualify for the monthly benefit. Families with three children get 1,000 złoty, and 500 złoty for each additional child. It reminded me a bit of your comment. There have been several studies using fMRI where preferences for political persuasion are concerned. If you take ‘immigration’ as the central theme it is more likely that negative reactions will arise in those of us having right-wing leanings. This is because it is seen as a threat and the brain’s limbic system swings into action. That is, the amygdala perceive this ‘threat’ and override areas in the frontal cortex where higher reasoning rakes place, notably the right frontal cortex and the anterior cingulate gyrus. This is less likely to take place in the brains of left-wingers who are more likely to be acquainted with the method of pursuing truth via logic and dialectics. Free will? Deus ex machina?